You probably have a $1 bill in your wallet right now, but have you looked close enough to see the symbolism hidden right in plain sight? Check out this list and get ready to have your mind blown! Look closely at our first president’s eyes and you might notice this interesting detail. The official stance is that they’re stars, but many have argued that the pointed ornaments on George Washington’s eyes are actually marijuana leaves. The drug is still illegal in most states, but the symbolism on the dollar makes you wonder if the Founding Fathers ever wanted it to be outlawed in the first place. If you don’t look hard enough you just might miss it, but the faded picture of musician David Crosby, commonly known as The Faded Croz, is mysteriously nestled to the left of Washington’s portrait. Many have debated its meaning, but most agree that it portends some sort of tragic event in the nation’s future. If you examine the back of the bill, you might notice what appears to be a three-panel comic strip taking up the entirety of its surface. That’s not a trick of the light! It’s the long-running comic strip Batter Up!, which has appeared on $1 bills since the late ’60s. The comic is about a chatty catcher and umpire who always inadvertently distract the batter, often resulting in him striking out in the third panel. Cartoonist Duke Hamlin passed away in 2009, but reprints of his beloved strip continue to run on the backs of U.S. dollar bills to this day. Keep an eye out for this beloved American funny next time you look at a dollar! Bet you never noticed this before. In the bottom-right corner of the bill are two figures that appear to be the Twin Towers. But here’s where it gets really weird: Next to the towers is a label that reads, “Don’t worry, these aren’t the Twin Towers, these are different towers.” Crazy, right? 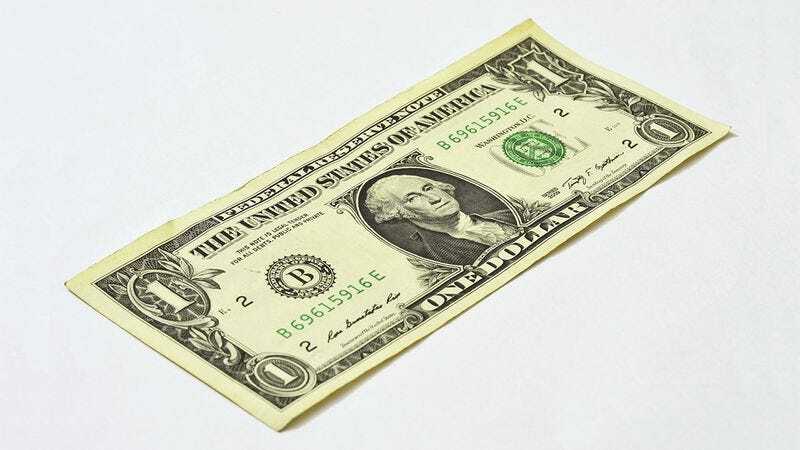 The designers of the $1 bill had a unique vision for the smallest unit of paper money, and part of it included printing a set of instructions for how to use the dollar bill on the bill itself. Read “The Instructions,” as they’re commonly called, in the picture above! Ever notice how the edges of the dollar are cut in the same way as a jigsaw puzzle piece? That’s no coincidence. Many conspiracy theorists believe that when every dollar in the world is connected in a precise arrangement, it completes a puzzle of Marilyn Monroe smoking a joint. There’s no denying that the little figure being squished by the pyramid isn’t just a smudge. That’s a little squished man. And his name tag reads “Hello, My Name Is Freedom,” which is even more evidence of some secret symbolic message. What could it mean? The Hidden Vapers are one of the more famous secret symbols on the $1 bill. But as famous as they are, the story behind the Hidden Vapers and what they mean is still shrouded in mystery. Who are they? Why are they vaping? What kind of e-juice are they using? We may never know. Once you see this one, it can’t be unseen. Just to the right of Washington’s head, there’s a relatively unnoticeable dotted line. To the right of that line is a tear-off coupon for a free appetizer or dessert with a purchase of an adult entrées at Chili’s. Illuminati? You be the judge.